US veterinary surgeons operating on a sick dog got a shock when they discovered the cause of their patient's malaise - 43 and a half socks. The 64kg Great Dane had an affinity for chewing socks but no-one knew he was swallowing them whole, a spokeswoman from the animal hospital said. The vets, who operated on the dog in February, said that it was the most socks they had pulled out of an animal. The dog, which recovered, has now won a prize for its strange eating habits. 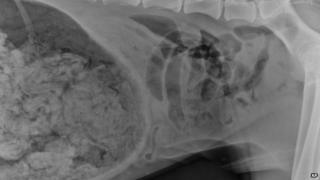 "The x-rays revealed a large amount of foreign material in the dog's stomach, at which point the dog was taken into surgery to have the material removed," the DoveLewis Emergency Animal Hospital in Portland, Oregon said in a statement. "That 'material' ended up being 43.5 socks, much to everyone's surprise! The dog recovered smoothly and was discharged home the next day." Now the hungry canine has taken third place in a contest entitled "They Ate WHAT? ", organised by vet magazine Veterinary Practice News. The top prize went to a frog that ate more than 30 ornamental rocks from his cage. Judges also awarded other honourable mentions to a kitten that ate a toy alien figure and a golden retriever that swallowed a light bulb.